"Blind Rage", the new album from German/American metallers ACCEPT, has topped the official German chart. Comments Nuclear Blast owner Markus Staiger: "We are proud and thankful to be part of ACCEPT's rebirth in 2010. With a No. 1 position in the German chart, they climbed the to the top of Mt. Olympus. This is the reward of the consequent hard work of the band, their manager Gaby Hoffmann and Deville Schober and the whole Nuclear Blast team. Together we stand strong!" Adds ACCEPT in a statement: "Four years ago we decided to start ACCEPT anew. Of course we hoped to reach the fans of heavy metal and leave a few more marks in its history. None of us would have thought that we could reach No. 1 in the official German charts. 'We would like to thank our team, our label partner Nuclear Blast, Warner distribution and Brainstorm Music Marketing, all of who gave us enormous strength and the will to continue in order to make this happen." "Blind Rage" was released on August 15 via Nuclear Blast. Like its two predecessors, 2010's "Blood Of The Nations" and 2012's "Stalingrad", the new effort was helmed by British producer Andy Sneap, who has previously worked with MEGADETH, EXODUS, TESTAMENT, ARCH ENEMY and KILLSWITCH ENGAGE. The cover artwork was created by Daniel Goldsworthy. The "Stampede" video can be seen below. The clip was filmed on location in the high desert of California at the Devil's Punchbowl (a rock formation that looks like it's from another world) with director Greg Aronowitz ("Batman & Robin", "A.I. Artificial Intelligence", "The Lost World: Jurassic Park"). 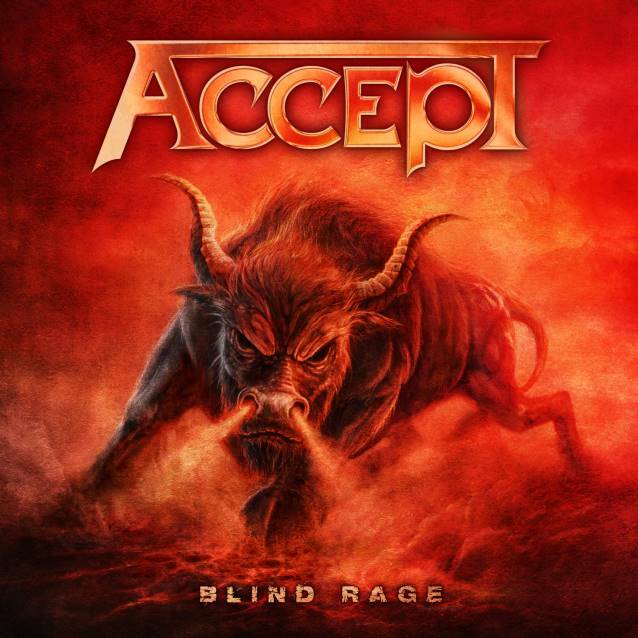 ACCEPT will promote "Blind Rage" with a European headlining tour which will kick off on September 19 in Copenhagen, Denmark. In a recent interview with Metal Assault, guitarist Wolf Hoffmann stated about the musical direction of "Blind Rage": "I think what we have here is really a collection of totally typical ACCEPT songs with the classic feel, and, of course, as always, there's an overriding theme of aggression and rage in all our music. I mean, otherwise it wouldn't be metal. "People call our music at this point 'classic metal,' I believe, and we just fell in love with the title 'Blind Rage' and the artwork. Interestingly enough, we don't even have a song called 'Blind Rage'. We just have a collection of songs that to me all feel totally 100 percent classic ACCEPT." Regarding the songwriting and recording process for "Blind Rage", Wolf said: "Andy is such a good partner now, we couldn't even imagine working without him on this album. He's such a natural fit and he did a great job on the last two albums. The only thing that we did way different this time from 'Stalingrad' is, we really took our time. 'Stalingrad' was really made almost in a rush, to be honest, because we had so many commitments right before we went to the studio to do the album and right after. Basically, by the time we started working on that album, we already knew when it had to be finished and what gigs we had booked. So that put us under enormous pressure, but this time, we really made sure it's right before it's ever released. We didn't work excessively long, we just took a little more time to make sure that we were in a little more comfortable place. These last few weeks we've just refined and tweaked little things that we normally wouldn't have the time to do." 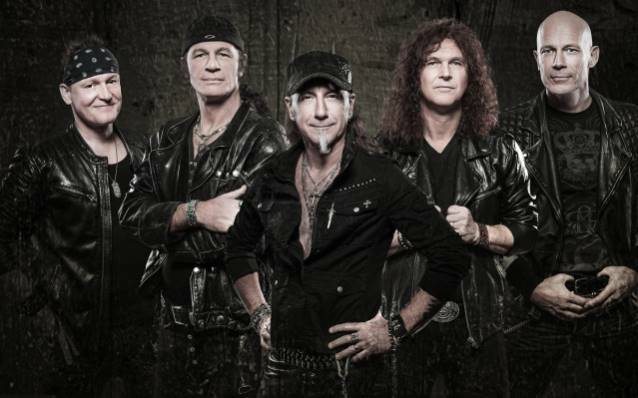 Speaking to Metal Wani ACCEPT singer Mark Tornillo stated about what fans can expect to hear on "Blind Rage": "You can expect more of the same, but you can also expect, on this album, a little more diversity, I think. And the way I see it, some of the songs sound more classic than the stuff that we've done. I mean, there are songs, I think, when I hear the opening riff, I go, 'Wow! That could be on 'Balls To The Wall'.' So you're gonna get a few different… I mean, we're not searching for a direction at this point. We're writing to please ourselves and to please our fans… We're not changing horses in the middle of a stream. I mean, if something works for us, we're gonna stick with it. We're certainly not gonna change direction, but I think we're not afraid to step out a little bit. We're also not afraid to go back and be what the band was in the '80s, which is what we've really strived for." On the topic of the vibe in ACCEPT during the songwriting process for "Blind Rage", compared to how it was for its two predecessors, 2010's "Blood Of The Nations" and 2012's "Stalingrad", Tornillo said: "The vibe is good. We're, I think, more relaxed at this point. 'Blood Of The Nations' was… We really had no idea where we were going at that point; we didn't even have a record deal when we wrote that record. We had no idea what was gonna happen and where it was gonna go, and we had a lot of time to do it. And then the response came, and we set the bar pretty darn high with that record. And then when we went back to do 'Stalingrad', we didn't have that luxury of time; they gave us a deadline, that they wanted the record by such and such a time, and it was a little more hectic. There was a lot more pressure than [there was on 'Blood Of The Nations']. Plus we had 'Blood Of The Nations' out there, and we had to try to top it, if possible, or at least try to get to where that record was. This one, we've had a little more time. This past year, all we did was festivals, which was nice, which gave us time to write on the road. And when we were done touring, we had a good three or four months to complete everything, which is a nice time frame."